Happy hump day everyone! It already feels like Friday, I have two deadlines looming above my head and my week has been all work and no play so far. Luckily I was a good girl and prepared this post on Sunday otherwise this week would be postless. I want to start a new monthly column called mini makeover where I post about small improvements to our house or other little projects. With the pressure of having to finish 12 small projects over the course of the year I will finally get on to some projects I had in mind for a while. 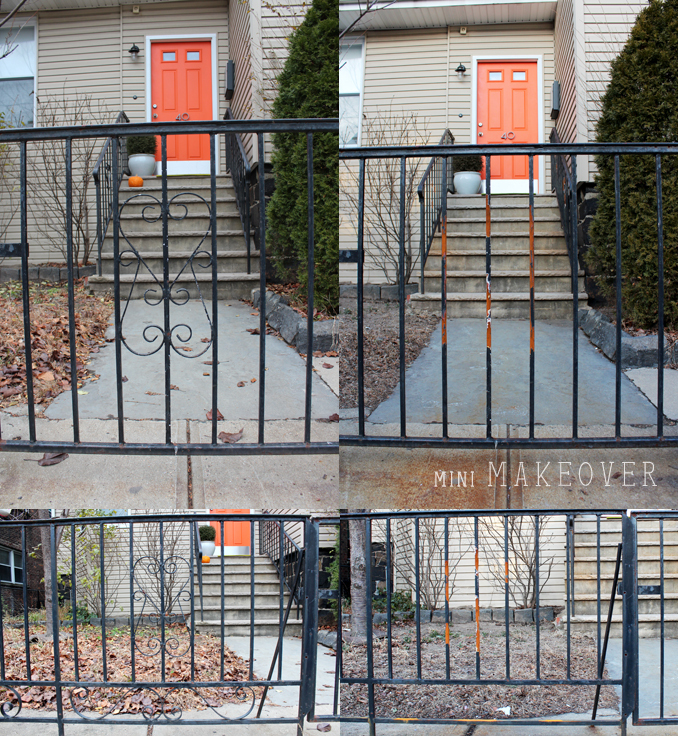 Today's mini makeover is the fence in the front of our house. It had all these ornate decorative pieces in it and we wanted the fence to look more modern, so when our contractor was at our place to work on the bathrooms we had him cut out the decorative pieces. Now we are left with rusty spots where the pieces were cut out but once it gets a little bit warmer I will give the fence a good scrub with a metal brush to loosen up the old paint, maybe sanding it as well and then the fence will get a fresh coat of paint. Hopefully that will make the fence look like new again. Our railing at the stair needs a little bit more work, somebody has to come and fix the wobbly thing before I will be able to paint it. Can't wait for spring to come so I can start working on the fence and the overall curb appeal on the front of the house. What's on you list for a mini makeover? Or did you recently finish one? Can you believe we are in the last stretch of January already? Time is just ticking away...Last week was freezing cold and on Friday afternoon we got a little bit of snow. Of course the falling snow made me want to go snowboarding and so I headed to a mountain with a friend on Saturday. At first it was really cloudy but it turned out to be a gorgeous sunny day. And when I got back in the afternoon I took a nice long hot bath in the new tub to relax my sore muscles. I have to say I love our new tub and will use it many more times this winter. Sunday I spent taking photos for the blog as well as putting them together for upcoming posts...What did you do last week/weekend? Have a great start into the new week! Because the first DIY birdfeeder I made in October was such a success with the birds I made another one with a lamp shade I picked up at an estate sale a while back. I still have another glass globe lamp shade that I want to use for another still top secret project. For all the DIY challenged I have rounded up a selection of my favorite non traditional bird feeders you can just order online without getting messy with silicone and a string. 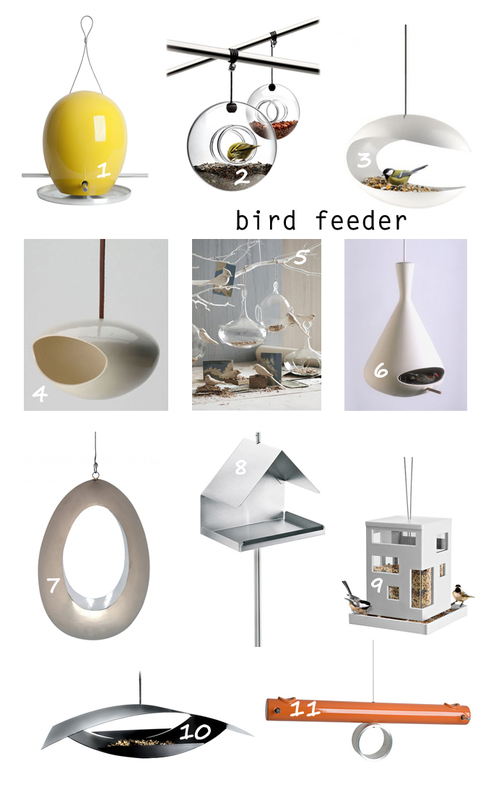 Do you have a bird feeder in your garden? 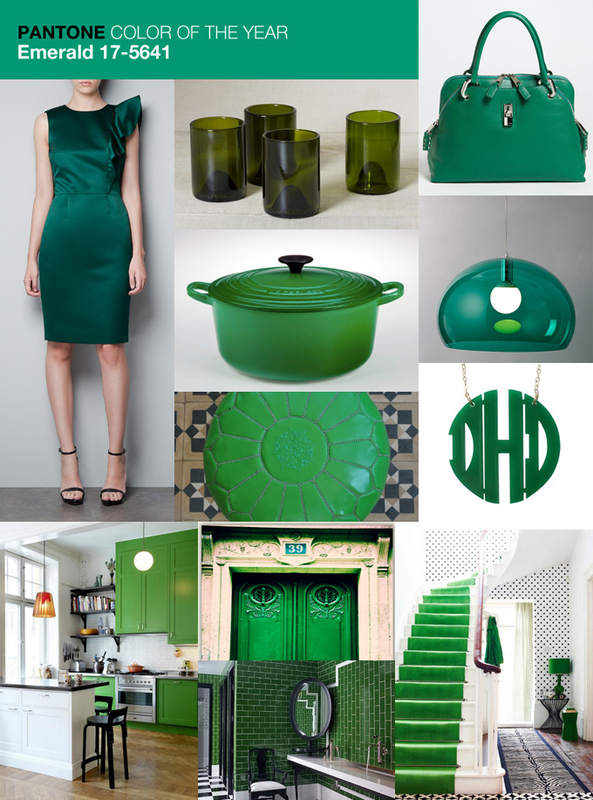 I know I am a little bit late with a color of the year post as it was already announced that emerald is the color of the year for 2013. According to the official announcement on the Pantone website the color is "Lively. Radiant. Lush...A color of elegance and beauty that enhances our sense of well-being, balance and harmony." At first I thought why green but when researching for this post I really fell in love with the color and all its different shades, so my finds are not necessarily just emerald green. The image with the stair was brought to my attention by Ana from Fluxi on Tour and it is another great option for my stair dilemma. What do you think about the color green? Wow, week three was a fast one. 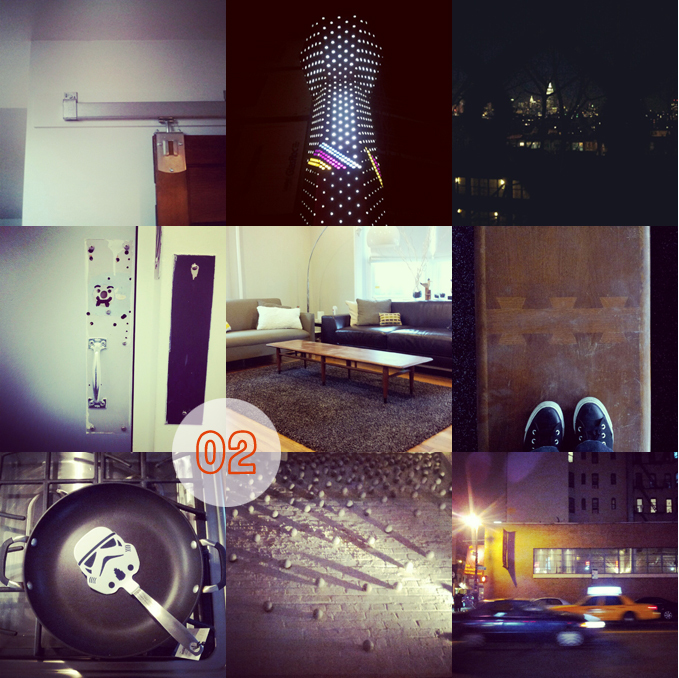 I didn't even take a lot of photos. The weekend I spent at a friends house in the Catskills with a group of friends. We went snowboarding on Saturday and Sunday, both days were gorgeous and sunny. It was my first day back on the slopes this year and today my whole body aches, I feel every muscle in my body. I decided to go offline for the weekend and didn't work on any posts for this coming week. That's also why I didn't prepare a post for today and it will be a very short one...Oh, well it's just going to be more work to get the posts ready in the next couple of days. How was your weekend? Hopefully equally good as mine! 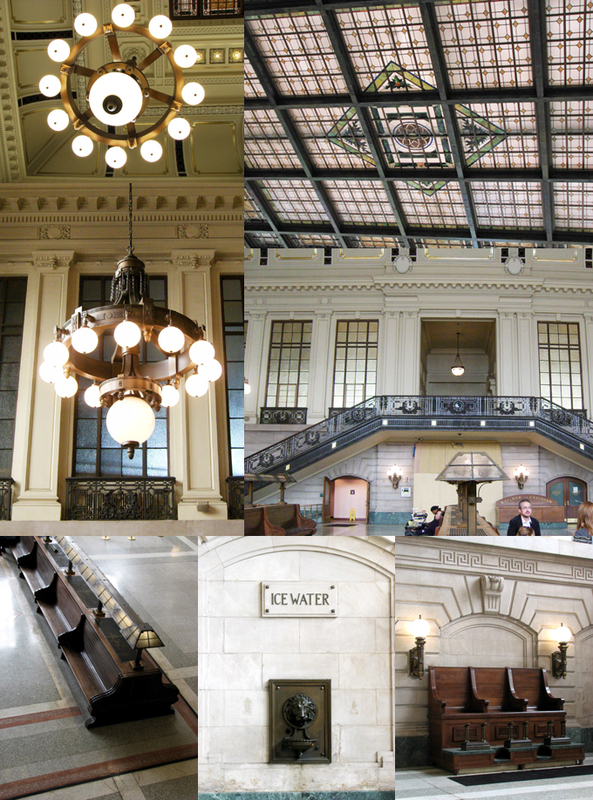 It is time for another post in my NJoy column and this time I have some photos for you of the Hoboken Terminal. I pass through this place every day, not the nice waiting area though, but I catch the Path train to the city at the station below. If you believe the Wikipedia article 50,000 people pass through the terminal daily, either through one of the commuter rail lines, the buses, ferries, or the path. 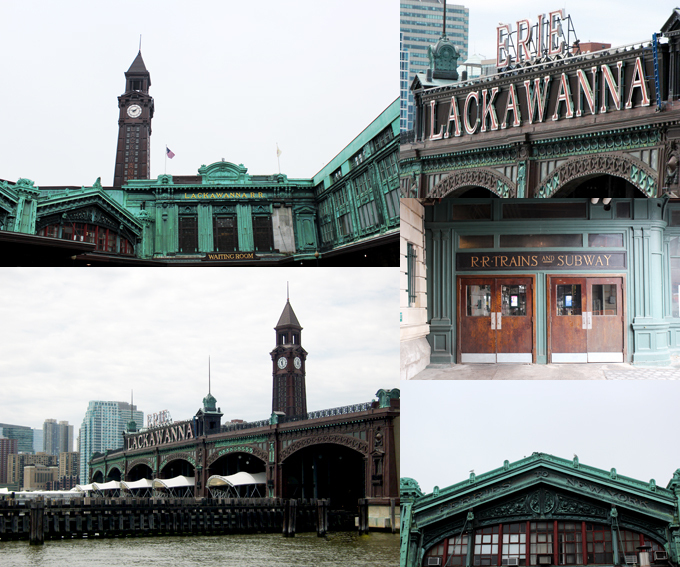 The rail and ferry terminal buildings were designed in the Beaux-Arts style by Kenneth M. Murchison and built by the Delaware, Lackawanna and Western Railroad in 1907. The copper clad façade is very ornate, unfortunately I couldn’t get a great overall photo of the façade with the copper on top and the limestone on the bottom as there are lots of porta-potties and a huge generator blocking the view. The terminal sustained water damage during Sandy and the waiting room with its toilets for the travelers passing through is closed. A 225-foot clock tower had been originally built with the terminal but it had been dismantled in the 1950ies due to structural damage. In the year of the terminal’s centennial in 2007 a new clock tower was built which is now overlooking the structure. If I hadn’t read about it during my research for this post I would have believed the tower was the original one. We moved to the area a year after the tower was built and I have never seen the terminal without it. The interior of the waiting room is beautiful on its own, I would have never guessed that it was there because from the side I enter the terminal it doesn’t look that spectacular so I was surprised when we went inside the first time in the summer of 2011 with P’s parents. The interior photos are from that time, I tried to take some more last weekend but the waiting room is closed. My father in law actually took three of the photos from this post, I or rather P asked him what photos he had to make my post complete. I just love the old timey feel of the interior, you can imagine waiting for a steam powered train while sitting in one of the wooden benches. Notable is also the large stained glass ceiling by Louis Comfort Tiffany. Funny enough I have seen the station play roles in movies too, in the German movie Friendship it was Central Station in NYC and in the movie Julie & Julia it was one of the train stations in Paris where Julia and her husband pick up her sister. I love spotting places I know in movies and a lot of times the location is very off. Are you like me and watch for those little details in movies? Happy Friday everyone! I am off for a weekend of snowboarding in the Catskills. What are you guys up to? 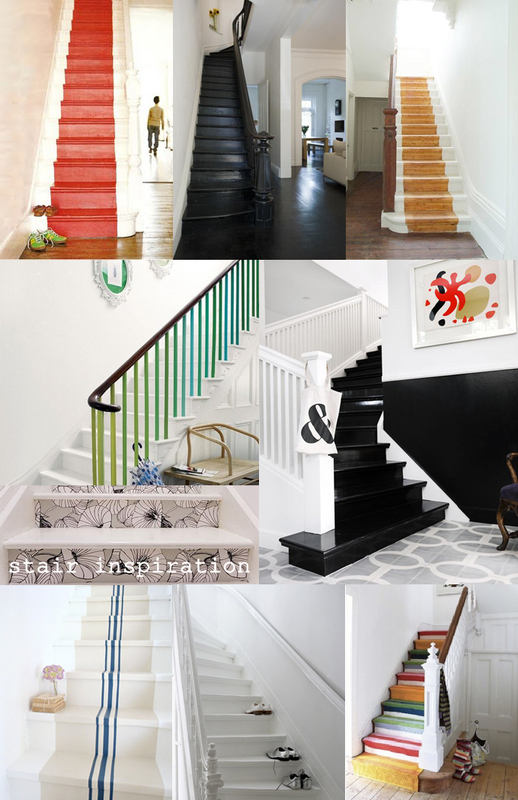 Are you for bold colors, monochromatic white or classic black on staircases? What was your weekend like? Have a happy week! Happy Friday everyone! 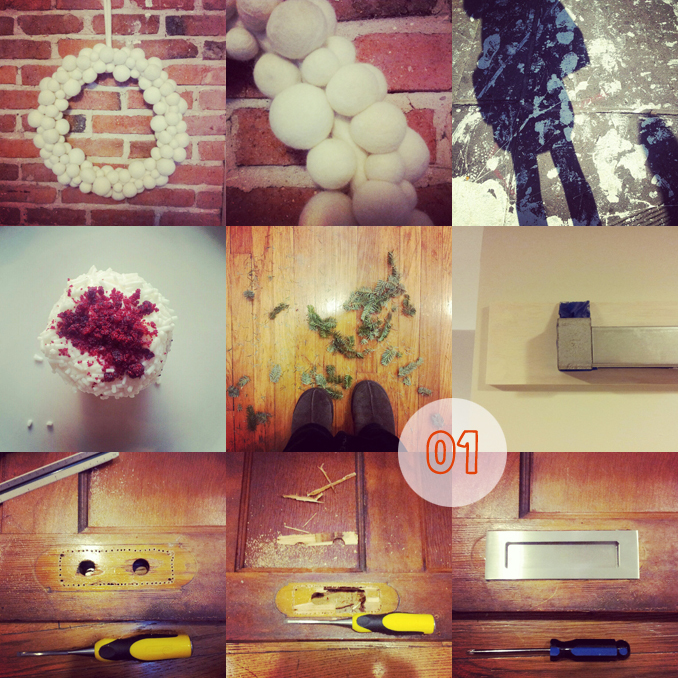 The first full work week after the holidays is coming to an end and I am finally starting to ease back into the groove of daily life, here on the blog, at work and at home. Today I will photos of our guest bathroom as promised on Wednesday, the contrast between the before and after are not as stark as with the powder room because the guest bath looked decent, if you can't see the loose tiles in the tub surround. But as I mentioned before it looked only good on the outside, below the toilet the floor was rotting away because the toilet was not installed properly and must have been leaking since it was installed. Since all the drywall was in good condition we only replaced the area around the tub with cement board and of course the subfloor was replaced as well. We had known from the beginning that we wanted white subway tile and mosaic floor tile, either hexagon or penny rounds. And I don't regret our decision one bit. Really glad we decided on black grout too. The wall color is a warm gray called Amherst Gray from Benjamin Moore's Historical Color collection. We picked the Lillången sink & cabinet from IKEA because of its depth, we didn't have enough space for anything deeper and wanted a solution with storage underneath. For a tub we loved the Cube Collection from Wetstyle but not the price, so I searched the internet for an affordable solution and found one from American Standard at a fraction of the price. We found it at a Lowes in the area and had it delivered but now they don't seem to carry it any longer. Most of the little pieces, like the mirror, towel holder and tub caddy we already owned and when I saw the matching wooden bath mats on a recent IKEA run I had to have them. I like the light birch color with the white of the tile and the gray of the walls. Hope our first guests will like the bathroom as much as we do. I am looking forward to be able to take a nice long bath in our new tub this weekend, with candle light and a glass of wine...What are your plans this weekend? Hope you will have a great one! I know this post has been a long time in the making but now it is finally time to reveal the renovated bathrooms, the powder room makes its way onto the blog first. Can you believe we started with this sad looking space? Me neither! Even though the room is small, some serious work went into the completion of this room. As previously mentioned the exterior walls and the pipes under the floor were not insulated, which made the space feel like a chilly outhouse in the wintertime. When we started thinking about redoing the powder room we immediately knew that we wanted to use up some leftover subway tile from our upstairs bathroom. One wall tiled from floor to ceiling gives this room some interest and after painting the walls I already loved the contrast between the white tile and the dark gray. 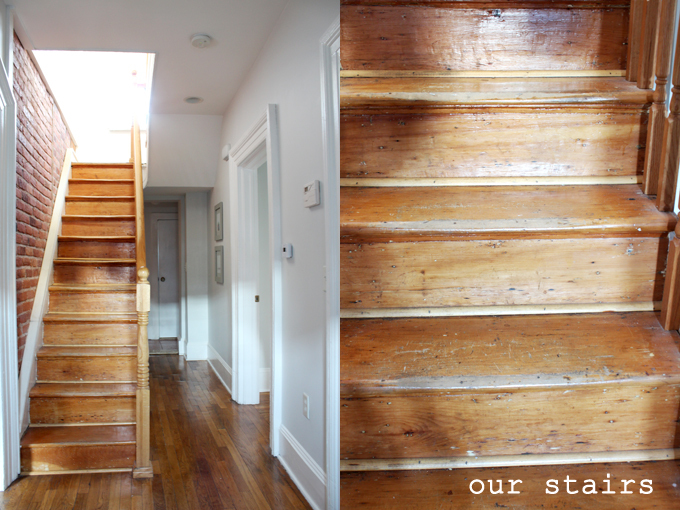 We used Benjamin Moore's Racoon Fur again, like we did in the entry vestibule. What a cute name for such a cool color. First we thought about getting a simple frameless mirror above the sink but couldn't find one in the right size, my next thought was that maybe I could find cool vintage mirror at a thrift store or an estate sale but then P suggested that we could reuse the mirrored door from the old medicine cabinet. It was a great idea because the dimensions were perfect, I just needed to spray paint the frame. Because the room was only black/gray/white we decided to use the yellow I had left over from spray painting a necklace last year. 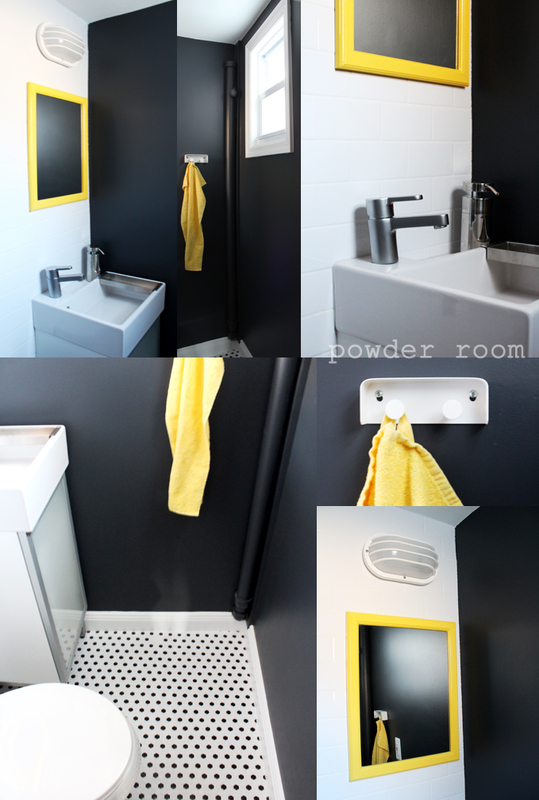 We love our new powder room and are not using it for storage and cleaning paint supplies anymore. 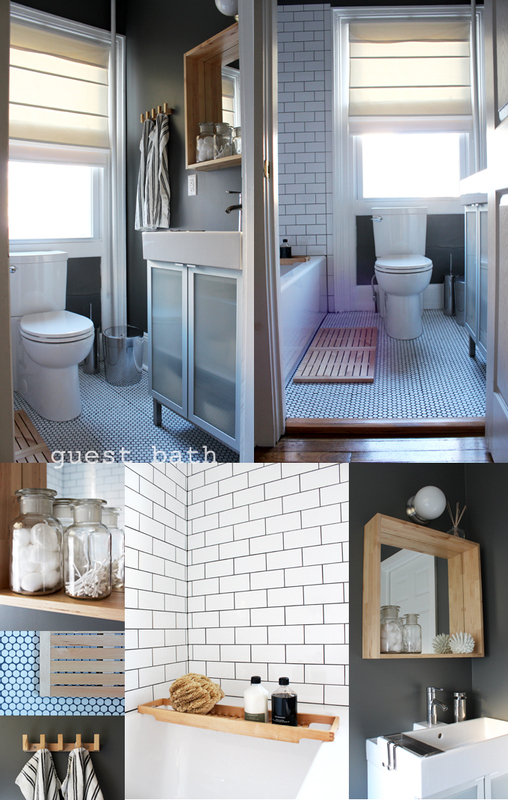 Are you ready for the guest bathroom reveal on Friday? 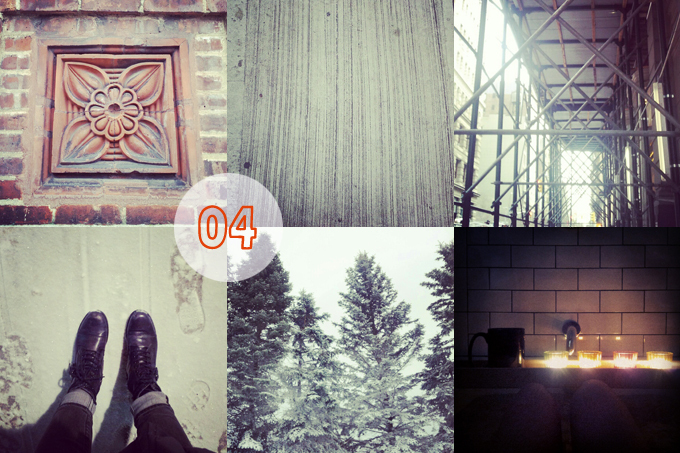 Can you believe that the first week of 2013 is already over? My work week went by pretty quickly, as it was only three days long but the weekend felt oddly short after having two four day weekends in a row. I was still pretty productive this weekend though. On Saturday P took all the ornaments off our Christmas tree and I took off the lights, the tree moved into the front yard and will be picked up on Thursday. Everything that looks like Christmas is back in storage now, even the wreath I bought at the beginning of the week on Sale at West Elm. Already looking forward to put it back up again at the end of the year. I also installed the new recessed handles for our new barn door and painted the piece of wood behind the track. Now it's all back to normal again and this week will be a full week, honestly I could have gotten used to the three day work week and the four day weekends ;) Have a great week! Usually by this time I already have picked a new calendar for the year but this time I totally forgot about it and thought it would be fun to round up a selection of calendars that you can use again every year. I am a big fan of No. 1 & 10. The chalkboard wall calendar (No.2) would be great for my "office" so I can write down when I want to post about what topic on the blog and keep my schedule in check. 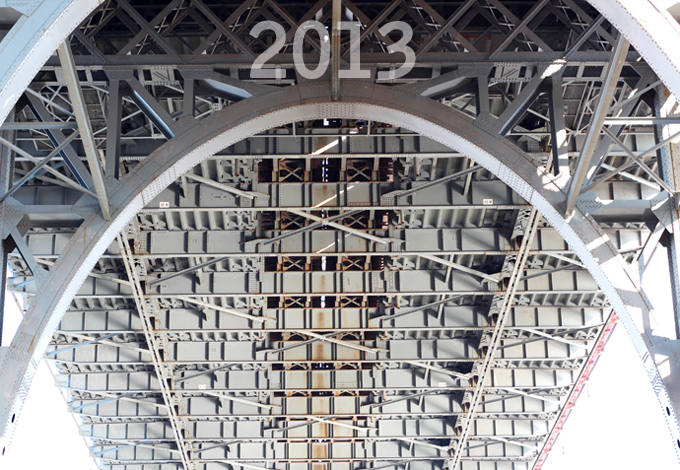 What does your calendar for 2013 look like?